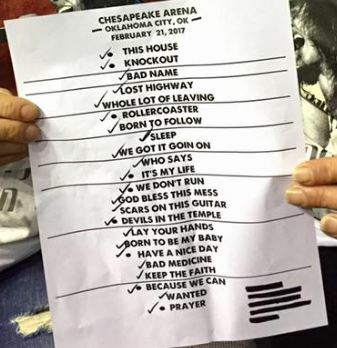 #08 2017/02/21 - Chesapeake Energy Center, Oklahoma City, Oklahoma, USA - bjtourss Webseite! Work For The Working Man is dropped for the first time this tour. It's replaced by We Weren't Born To Follow. Raise Your Hands is dropped. During Bad Medicine Jon sang the second verse instead of the first. He stopped the song and called it a senior moment.